FILE - The logo of Exxon Mobil Corp. is shown at the New York Stock Exchange. Venezuela's foreign ministry on Tuesday described as "interventionist and disrespectful" U.S. comments on a weekend incident in which Venezuela's navy stopped two ships exploring for oil for Exxon Mobil off Guyana's coast. Each of the neighboring South American countries says the incident on Saturday occurred within its territorial waters. In response to the event, the U.S. State Department said Venezuela had behaved "aggressively" and called on the country to "respect international law and the rights of its neighbors." "It is evident that the U.S. government is interfering in a matter that is not at all incumbent upon it, with the goal of promoting corporate interests closely linked to the Washington ruling elite," the foreign ministry said in a statement. FILE - Venezuela's President Nicolas Maduro speaks in Caracas, Dec. 9, 2018. 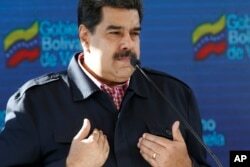 Socialist President Nicolas Maduro has accused the United States of plotting to invade Venezuela and overthrow his government, while Washington has placed sanctions on Venezuela's debt and members of Maduro's government over accusations of corruption, human rights violations and election-rigging. A century-long territorial dispute between Venezuela and Guyana has flared up in recent years with Exxon's discovery of more than 5 billion barrels of oil and gas off Guyana's coast. In OPEC-member Venezuela, crude output is hovering near 70-year lows amid a severe economic crisis. Guyana says Caracas gave up its claim to the Essequibo, a sparsely populated jungle area making up two-thirds of Guyana's territory, after an 1899 ruling by an international tribunal, but Venezuela later backtracked on that decision. The U.N. this year referred the dispute to the International Court of Justice. Two vessels owned by Norway's Petroleum Geo-Services and under contract by Exxon Mobil were conducting seismic survey work in the area. The ships stopped their work and turned east after the Venezuelan navy told them Guyana did not have jurisdiction there. When asked on Monday if there were plans for the vessels to resume their activities, Guyana Foreign Affairs Minister Carl Greenidge said the government was "in discussion" with Exxon. Neither Exxon nor PGS immediately responded to requests for comment on Tuesday, and the U.S. State Department declined to comment. On Monday, the Caricom group of 15 Caribbean nations including Guyana — many of which have historically received subsidized oil from Venezuela under Caracas' Petrocaribe program — said it viewed the "interception" by Venezuela's navy "with grave concern." "Such acts violate the sovereign rights of Guyana under international law," the group said in a statement.